Weight Loss Retreats for Overweight Adults – Healthy Vacation Alternative! A traditional family vacation is normally centered around traveling, exploring new places, indulging in calorie packed meals and, unfortunately, packing on a few extra pounds. Why not try weight loss retreats, a healthy vacation alternative. A combination of a weight loss clinic and a luxury spa, weight loss retreats allow individuals or families to learn about nutrition, sample new diet choices, exercise routines and, finally, come home slimmer. From coast to coast, you can find all sorts of fantastic weight loss retreats for women and men in California, Las Vegas, Utah, Texas, Arizona, New York and Vermont. At the beginning, guests are encouraged to meet with a health professional, dietician and a personal trainer to address various health, emotional and other concerns and set goals. Later on, guests can choose from a menu of activities that are sure to be the highlight of any weight loss camps for adults ranging from kayaking, boxing, water aerobics, swimming, dancing and so much more. Depending on your recommended calorie intake to lose weight count, the accommodation price of weight loss retreats includes 3 delicious meals that are also great for your figure. Apart from counting daily calorie intake for men or women and exercise classes, these camps offer a plethora of activities that will make you forget that you are actually losing weight. From healthy cooking classes, to lectures on stress management and relaxing spa procedures, your days will be packed with knowledge and new encounters. One weight loss camp in Utah, which appeared on the popular NBC TV show “The Biggest Loser”, has won the first place among the SpaFinder’s readers’ choice awards in 2012. The Biggest loser camp in Fitness Ridge, Utah focuses on intense and group oriented activities you will not find anywhere else. The morning hike is the first experience of the day taking its guests to the scenic area followed by a group workout surrounded by picturesque Utah Mountains. Strength training, core exercises, water sports are just a short list of activities you can choose to partake. World-class chefs create calorie controlled meals to enhance your weight loss goals. At the end of the day, guests can choose to relax in a heated outdoor pool or a local luxury spa offering several different experiences ranging from deep tissue of Swedish massages, slimming body wraps or refreshing facials. The Resort has several US locations to choose from for the convenience of its guests in Ivins, UT, Chicago, IL, Malibu, CA and Niagara Falls, NY. 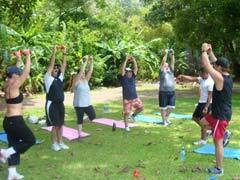 Weight loss retreats are structured programs that aid in helping you to lose the weight during an enjoyable vacation. A combination of exercise and enthusiasm, weight loss retreats keep the motivation high and the self-confidence even higher. These healthy vacation alternatives will inspire their guests to carry on the newly acquired knowledge on fitness, nutrition and weight management to their everyday lives.